As antique texts and works of art increased in circulation among scholars and their patrons, paintings and sculptures featuring themes and personalities from the antique past became popular subjects. Decorating the public and private rooms of one’s house with such art was another way of demonstrating one’s learning. Depending on the specific theme chosen, it could also be a way of providing a model for proper behavior or even of announcing one’s special virtues. An intriguing aspect of the Renaissance use of antique themes is the way in which antiquity and Christianity could come together—the pagan gods and the Christian God merging in a single, multilayered image. Hercules: Divine hero of extraordinary feats, strength, and cunning, as established by his twelve deeds. Strong, clever, equal to any challenge. Venus: The goddess of beauty, wearer of fine garments, favoring luxury and easy living. Admired by the other gods for her good looks. As the preeminent goddess of love, she also serves as the goddess of fertility. Minerva: The signifier of wisdom. Most often depicted as a warrior figure in armor. Brooks no nonsense; will stand up to anybody and anything. Mercury: Jack of all trades. A messenger god who will serve as a go-between for the gods above and the mortals below. Known as a supporter of the arts and commerce. Bacchus: God of pleasure and sensual delights. Known as the inventor of wine, and thus the god who favors and encourages the drinking of wine. Neptune: The god who rules the seas. A particular favorite in Italian territories engaged in maritime commerce. Jupiter: The most powerful of the immortals and thus king of the gods. He must have his way, is permitted anything, and can do no wrong. Works featuring the antique gods take a variety of forms. The infant Bacchus, depicted in a small painting by Giovanni Bellini, is fresh faced and engaging, looking out invitingly at the viewer as if promoting the innocent pleasures of the saying “eat, drink, and be merry.” This type of “baby Bacchus,” however, is extremely atypical in terms of antique representations of the god. A veiled double reference to Bacchus and the infant Christ—suggesting that wine may bring the kind of inspired revelation that leads to an understanding of the Christian mysteries—may be part of the intended message here. A popular use of the antique gods was in the embellishment of the decorative tray, known as a descho da parto (childbirth tray), fashionable as a gift to new mothers. 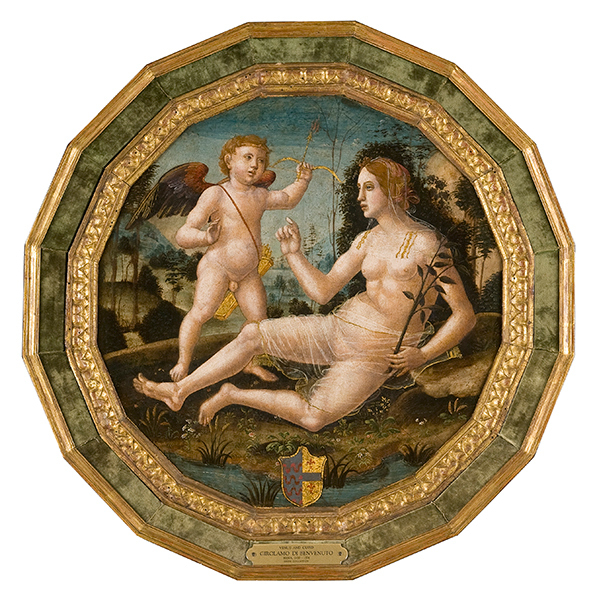 Venus, the goddess of love and fertility, was favored, as in the handsome tray painted by Girolamo di Benvenuto about 1500. Venus reclines at her ease, her head modestly veiled as a Florentine matron’s might be, and holds a laurel branch, an attribute of learning and good fortune. Winged Cupid, the god of love, stands alongside her brandishing a golden bow and arrow. Venus and Cupid are presented in dialogue, with Venus seeming to instruct Cupid in the proper ways of love. Conjoined arms—presumably those of husband and wife—appear in a shield at the base of the tray. Antique themes could also present a stern message. One example is the depiction of an incident from ancient history known as the Continence of Scipio, transmitted by the Roman historian Livy. Giovanni Bellini illustrated the events in a painting; he used tones of gray against a reddish marbled background to give the impression of sculpture, the suggestion being that the work brings to life not only an antique subject but also an antique marble. At the left side of the panel the victorious Roman general Scipio is shown enthroned, backed up by his soldiers. A crowd of Carthaginian captives assembles in front of him. At their head, with downcast eyes and demurely veiled, is the young woman offered to Scipio as booty, whom he generously relinquishes from all obligation. 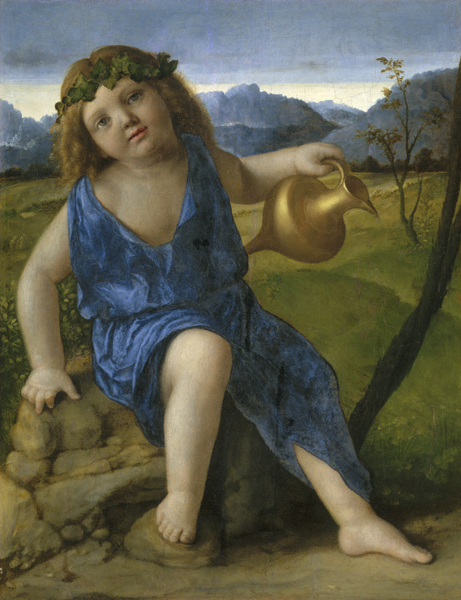 The work would have had direct relevance to the patron; the painting is known to have decorated the palace of the Cornaro, a Venetian patrician family who traced their lineage to the Cornelii, to which Scipio also belonged.